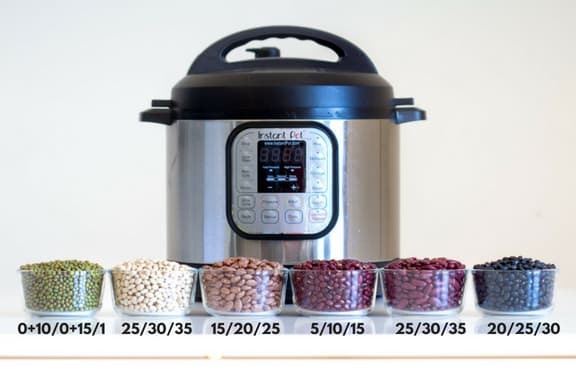 After seeing the same question popping up over and over again in several Facebook groups: “how to cook beans in the instant pot”, and after reading answers that couldn’t differ any more, I felt the urge to find out timings for myself. Just like back when I saw the same happening for Instant Pot Rice. I’ve read people recommending cook times anywhere from 10 minutes all the way up to 60 minutes. How can that be? Why do the recommended times differ SO MUCH?!? I had to get to the bottom of it. Well, first of all, many times it isn’t even specified what kind of beans. There are soooooo many kinds and they all cook in different times. Asking “how to cook beans in the instant pot” is basically an incomplete question and often results in incomplete answers. Second of all, it is never specified what the beans are meant for. Depending on if you want them for a salad or a soup makes a huge difference. For a salad you want them barely cooked so they hold their shape, stay dry and don’t become mushy. For a soup you want them super cooked and falling apart by themselves so you can blend them and create a creamy soup. And lastly,it is rarely specified if the cooking time is requested or suggested for soaked or dry beans. This also plays a huge role in timing. Which brings us to the first question and answer in our Instant Pot Beans Encyclopedia. Let me answer one important thing first: yes, you CAN cook both, soaked and unsoaked beans in the pressure cooker. So if you desperately want to skip the soaking process you absolutely CAN. The question, however, should not be if you CAN cook no soak beans. The question is: do you really want to skip the step? If you’re more like me and like eating healthy and yummy food without bloating and farting (high five my friend) then soak your beans for 8-12 hours before pressure cooking. Generations and generations before us already knew about this trick and I rely a lot on their experience. A pressure cooker doesn’t break down the beans to a point where soaking isn’t necessary anymore to ease digestion. Maybe one day someone will invent a magical machine that can but for now, there isn’t one on the market that I know. What the instant pot does it cook beans faster to reach the same consistency a regular pot with water does. That’s the advantage of pressure cooking. The soaking is still necessary. There are other tricks to ease digestion such as adding “epazote” during the cooking process and/or removing the foam that forms on top. The most important and most effective is soaking though. Don’t skip the soaking even if you add epazote and remove the foam. Sooooo, all experiments run for this post are for beans soaked for 12 hours at room temperature using filtered water. Then drained and rinsed and cooked in just plain, fresh, unsalted water. Ok, now that we’ve had have that discussion let’s get to the next point. My fist tests were run with Black Beans and that’s how I found out that the discrepancies of timing are often times likely due to what the beans are meant for. After cooking for 30 minutes + complete natural pressure release the beans were nice and soft and perfect to use for a soup. They were cooked to the necessary consistency to blend into a smooth black bean soup. However, they were way too soft to drain and use for a salad. They were much much softer than the black beans you’d find in a can for example. The canned black beans are pretty firm and after draining ideal for a salad for example. So the next goal was to find the best pressure cook timing to achieve firm beans for salad AND a consistency somewhere in between for Instant Pot Beans and Rice. Not too firm and not too soft. After 20 minutes of high pressure cooking and full natural pressure release the Instant Pot Black Beans were thoroghly cooked through but still firm. I was able to drain them and use them in a salad. After 25 minutes they had that perfect consistency for Instant Pot Beans and Rice. I thought all beans the same size would cook in the same time but no. It seems different beans have a different composition and cook differently. Pinto Beans cooked faster in my experiment compared to black beans. I was very surprised actually. So much so, that I will have to rerun this experiment. Pinto Beans were the last beans I experimented with and I’m wondering if my Instant Pots (<– yes, plural, I have several because I’m obsessed, haha) were maybe overheating and cooking stuff faster? Anyway, the Adzuki Beans definitely confirmed the fact that different beans cook at different times regardless of size. The Instant Pot Pinto Beans were perfect for draining and using in salads after just 15 minutes high pressure and full natural pressure release. Perfect for rice and beans after 20 minutes high pressure cooking + NPR. And suitable for soups after 25 minutes HP + NPR. 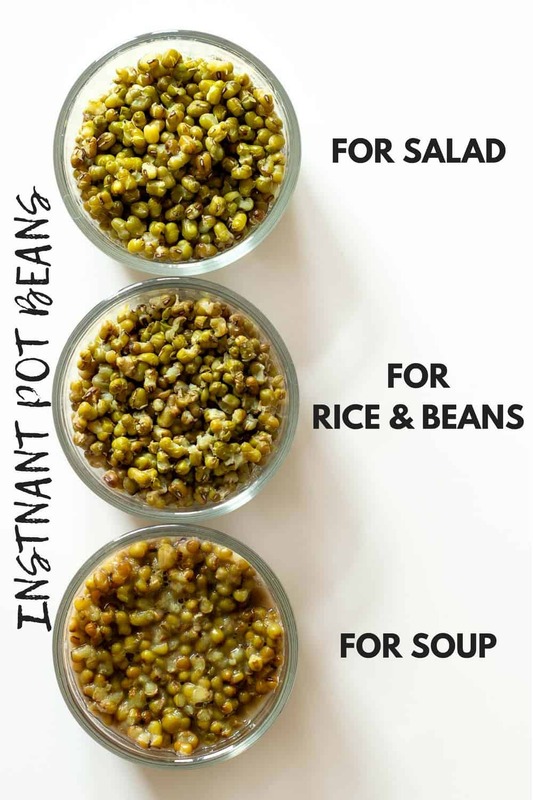 Depending on what you want your Instant Pot Beans for you may or may not want to flavor them. If you want your beans for a salad which will have a salad dressing it’s probably best to simply cook them in filtered water and nothing else. Drain the water and use the unflavored beans for your salad. For Instant Pot Beans and Rice or for soup you’ll probably want to flavor while cooking. There is a couple simple rules to follow. Add onion, garlic, spices (except salt) before or during cooking but salt after cooking. Salt can keep beans from softening up so you want to avoid adding while they are cooking but rather once they’re already soft. What I love to do is to prepare a “sofrita” first. You hit the sautée button first and while the pot heats you peel and finely chop onion and garlic. Once hot, add a splash of oil, the chopped onion and garlic and sauté until nice and brown. Then add beans and water and cook as instructed in the recipe card below. Drain beans and rinse really really well. Add beans to instant pot and cover with fresh water to about 2 inches above the beans (two thumbs thick). Put on the lid and turn the knob to the sealing position. Let pressure release naturally for specified time above, then, if safety pin hasn't dropped on its own yet, release remaining pressure manually. Calorie information for 1 cup black beans cooked in water. Very puzzled with some people getting mushed black beans and kidney beans with my times stated above and been trying to figure out why the discrepancies. I've tested the cooking times again with organic and conventional beans of different brands to figure out if that made a difference and it didn't so not sure what this could be attributed to. I wonder if the age of the beans plays a role. If you were successful with the times please let me know and if you were not please let me know at what timings your beans were cooked to perfection so I can run even more tests. At 10 minutes + NPR for black beans MY beans in MY pot had a sandy texture and tasted undercooked. Canned beans are already cooked so you don’t need to cook them, you just have to reheat them if you want them warm. In a pan is probably easier than in the Instant Pot. I use your fail-proof bean & rice guides all the time, so helpful. Thank you for doing the legwork so I don’t have to! I’ve been using a 25 lb. bag of Costco pintos that’s YEARS old. I soak a cup for 12 hours, rinse, cover (just barely!) with water, add onion, bay leaf, seasonings (any old), and pressure on high for 100 minutes. Perfection. As for me, it’ll be a few more years before I use up the remaining 20 pounds and have to experiment my way beck with new beans. Wow! I’ve never tried cooking beans thaaat long. I will definitely give it a try. Good posting. I don’t see a listing for red beans. I’m into red beans and rice and would like to do them in my IP. Sorry I haven’t tried cooking them so far. I don’t think I’ve ever cooked red beans so unfortunately, I don’t even know what their texture is to give you an estimate. YAY!!!! I’m so happy they turned out great!! I’ve definitely fund out over time that the beans I tend to buy are rather on the older side, too. People with fresher beans have found my times to be too long. One thing I don’t see here is any mention of cooking beans with tomatoes. If you are cooking dry beans and add tomatoes before the beans are tender, they will NEVER get any more tender. I believe it is the acidity of the tomatoes. It is possible to use this fact to your advantage. Say for example you are making chili. When the beans are exactly right, add your tomatoes. The beans will remain “exactly right.” No mush. Hm, that’s very interesting. I wonder if this doesn’t apply when pressure cooking though because I’ve made chilis in the Instant Pot with dried beans and tomato sauce at the same time and the beans cooked through just fine. But the water ph definitely seems to play a role. Several people commented on that already so it must play a role. Thanks for a intelligent research–and for hosting such an great thread of thoughtful responses. I bet water pH makes a difference—and that does differ from one part of the country to another. One old trick for getting beans to cook properly was adding a little baking soda to the cooking water, which would make it more “basic.” (Tomatoes or vinegar would make it “acidic.”) So people with slightly “softer” water than whatever you have may find their beans cook faster than yours. But since we all have whatever water we have, everybody can at least use your careful work as a starting point, adjusting the time up or down as needed. There’s really no way to know how old a bean is, under what conditions it was grown, and so forth. Thanks again. Thank you so much for your thoughtful comment Cate! Yes! Water pH definitely plays a role, too. I didn’t even think about taking that into the equation. I hope one day I find two completely different kinds of the same bean and then I’ll test cooking with my tap water and with bottled water, too on top. First of all I would like to say thank you. Other recipes I saw the time looked like the beans were going to be extremely under or over cooked. I made a bean soup which is several types of beans. It turned out great. I used your guide for red beans but added an extra 5 min because there were garbanzo beans in the mix. One bean was not as tender as I would have liked, but I didnt want bean mush. I thought it was the garbanzo but I picked one out and it was tender. Who knows. It wasn’t hard. Just not as tender as I would have liked. It was still delicious. Age definitely matters, the only thing i ever cook>20mins is chickpeas as they don’t really go to mush. I usually cook 10 bean mix from waitrose which has a whole variety including mung,kidney,canelleni,butter etc for 12mins for slightly mushy. I have on a few occasions bought a different brand of beans or found a bag at the cupbourd and they have come out rock hard at the usual setting. Yes, that’s what I’m seeing is happening to people. Depending on the brands they get different results. So there are two factors that can play a role. Bean age and bean kind. Maybe there is also different growing methods? Still trying to find out all of that. Wonderful info. Sprouted beans (pinto, kidney, etc.) also cook faster. I appreciate all your work! Yes, sprouted they cook super fast I probably wouldn’t even cook them in the IP. Sprouted lentils I usually cook like 5 minutes in boiling water, that’s it. I LOVE that you created this page. 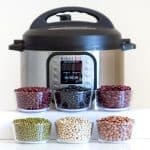 I originally bought my Instant Pot about a year ago and the main reason was so that I could cook dried beans and I couldn’t find any resources at that time that helped me. Today I cooked small red beans that I had soaked overnight for chili. I cooked them about 20 minutes. I actually had a brain freeze and couldn’t remember how to use the pot so turned it off after it had started heating up, so they cooked longer. They are great for soup, but I think I’ll cook them 18 min next time. Do you recommend draining them for using them for soup? Just reseal and set for another one, two three or whatever minutes. I’m so happy you found the guide useful Gale! Thank you for coming back and commenting and rating. I really appreciate it. I’m glad you found timings that work for you. I’m starting to believe it might be a mix of bean age and individual IP. 8 minutes for soaked black beans gives me close to raw beans. My IP can’t cook my beans that fast. I wish. How long is too long to soak beans? I set the beans to soak before bed, about 10 p.m. The next morning I went out and didn’t get back until 4 p.m.! Will that effect the beans cooking time? Hi Yvonne, up to 24 hours is totally save as long as you drain and rinse them after 12 hours and put them in fresh water to continue soaking. That way you avoid bacteria from building. The cooking time will most likely be affected. You’ll need to cook them a little less time. I haven’t experimented with that yet though. The age of the beans seems to play a much larger role in cooking time than anything else really. Hi Lorena, I just got a 3 quart Instant Pot, and am looking forward to using your guide. Can you please tell me if these times will work in a 3-quart pot? Hi Linda, the fact that it’s a 3-quart shouldn’t make a difference at all. Just know that 80% of people are successful with my timings and 20% are not because bean age seems to play a major role in cooking times. I’m still trying to figure out the magic formula that takes bean age into consideration. If your beans come out mushy know it’s not the 3-quart that is the issue but rather that you have fairly young dried beans. Thanks for the great information! I’ve favorited you page for future reference when I’m ready to try but have already decided that there’s no need to buy canned beans anymore! My question is how does bean age affect the cooking time? Do older veans need more time or less? I have a bean mix in the cupboard that would be considered older, but I’m going to cook them anyway! What time would I use for a soup with these beans after soaking? I use the 3rd time of the 3 that I suggest for each type of bean to make soup. Oh gosh, I have no clue Lydia, I’m sorry. I haven’t cooked most of those beans ever. Some of them I haven’t even heard about before. No advice on that, unfortunately. My friend bought an Instant Pot so I gave her the initial demo. I cooked a pot of mixed bean medley for 20 min on high with 20 min NR. I soaked them almost 20 hours with a water change in the middle. (I had planned to cook after 10 hours but something came up so I had to wait 10 more hours to do the cooking.) This soup included sauteing celery, carrots, potatoes, and a pepper, plus some spices (salt and tomatoes were added AFTER cooking) then added beans and vegetable broth to fill IP to half way; cooked on high pressure. I no longer have the package so I don’t know for sure what kind of beans were included but I imagine it’s a pretty standard soup mix. You didn’t mention lima beans and my mix had them so might be a bit different (or they may go by a different name). Next time I cook this soup I will only cook for 18 minutes. 20 minutes was OK but a little on the mushy side. I’ve been wondering about whether different brands of beans contain different varieties of beans? I’m sure there is more than one variety of black beans that farmers grow. It would make sense that this could have a substantial impact on cooking times. I know that when I’ve bought black beans from different sources they can certainly look different – some are smaller and duller in color and some are larger, darker, and glossy. Just a thought. I used organic kidney beans and cooked them at your middle setting. They are mushy. Sad. Cristine, I am just as sad as you :( I found out after many comments that the age of the beans plays a BIG role in timing so it’s basically impossible to figure out the right timing unless we all use same aged beans. It’s so annoying. I’m trying to figure out a formula but so far I haven’t been able to factor in bean age. 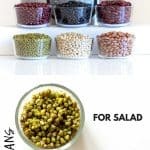 Thank you for this cooking guide for dried beans in the Instant Pot! I don’t cook them often, and so when I do I’m always scrambling to find the proportions at the last minute! This is great and it may inspire me to cook dried beans more often lol! According to Lorna Sass’s cookbook, you should slice open a bean lengthwise after soaking to see if they’re uniform in color; if they have a dark spot in the middle, then they haven’t soaked all the way through. I think you could check them at 4, 8 and 12 hours and beyond, perhaps this might help to keep them from being mushy? Ohhh, that’s interesting!!! I will definitely give this a try and observe. Seems to cover all the bases except altitude. Have there been any comments on how altitude can affect results? I moved from the Rockies to Florida, and noticed a huge difference in non-pressurized cooking. How much does this affect pressure cooking? From what I’ve read you have to add 5% cooking time per every 1,000 feet of altitude. I will never be able to confirm exact cooking times for anything but sea level because that’s where I do all experiments and cooking. However, considering bean age seems to play such a big role in cooking times, I found out over the weeks, that altitude changes are almost irrelevant. Most people are successful with my timings, so they must have similar age beans, but some people report as little as 8 minutes being enough to cook beans. After 8 minutes my beans are pretty much completely raw still. wow, what a perfectly put together article and timely! 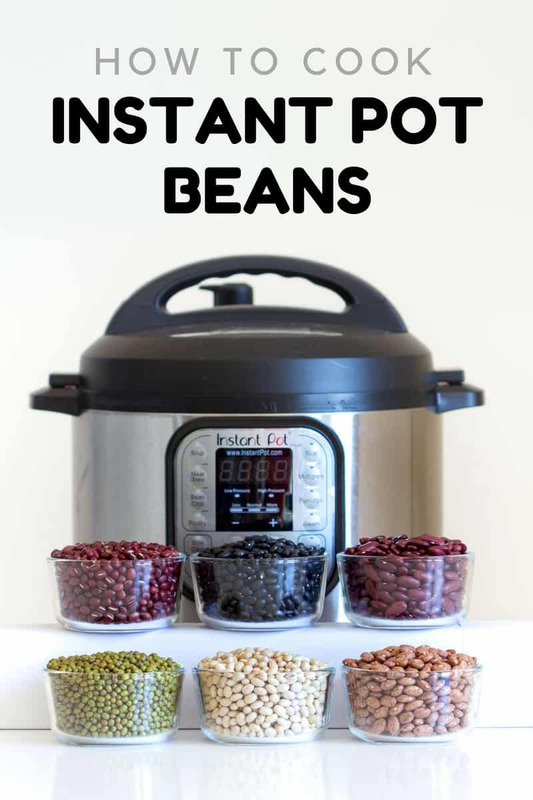 I have been soaking and cooking beans for many years the old fashion way and hav always found it hard not to have the beans fall apart somewhat and so today I though “the Instant Pot, why not!” and then I found your article. the thing I think is most important about this is that the instant pot does not create a rolling boil so the food does not get jiggled around constantly altering the structure of the item. Thanks so much for this great article. You are very very welcome Penny! I’m so glad you find it useful. Be warned. Some people are not having success with my timings. It seems like the age of beans plays a big role in cooking time. Unfortunately, I haven’t been able to calculate the magic formula including age in the equation. One day I hope I will be able to provide that formula. “Black Beans: 20/25/30 minutes + 20 mins NPR.” Why are 3 timings listed? Very confused. I’m glad I finally found a website that gives tried methods for cooking beans, it has been a journey. I would like to make the baked bean recipe I usually make in a slow cooker. Can I saute the vegetables first and add the sauce that has tomato paste water vinegar and molasses in it and then add the navy beans. I am using the 6 qt Duo. Hi Marion, I’m glad you like my post. It’s been a journey for me, too and I’m still traveling. All the timings have been true for me, my pot and my sea level and water so it’s super hard to find the magic formula for everybody. In terms of tomato sauce pressure cooking, that’s a difficult one. I’ve had tons of people report that they always get the burn warning when they cook tomato sauce in their pots. I myself have never seen that warning pop up on my display and I have two different Instant Pots. I am starting to believe that the ones that have the burn warning might be faulty. Anyway, I suggest you try with a small amount so you don’t waste too much in case it doesn’t work. If you have a 6 qt you should be able to pressure cook as little as 1/2 cup soaked beans and 1 cup of your sauce. I suggest you press sauté to stir-fry your veggies as you say, then hit cancel and remove the liner from the pot and put it on the counter to add beans and sauce, so it’s not too hot from the beginning. Add the liner back into the pot and then set to pressure cook as you would with water. Thank you for all your work and experimantation. I appreciat receiving instructions. Will be making beans tonight. Sorry my rating didn’t show up before. Sorry my rating didn’t show up before. Thanks for all your experimentation and for very helpful instructions. Will be cooking beans tonight. My husband and I have had an Instant Pot for several years but never had nerve to try beans. Not until I read your post. We tried pinto beans today and they turned out PERFECT! We added some ham to it also. We did 25 minutes cooking and then 20 minutes npr. The beans we have are not fresh. At least 2 years old. Thank you so much! Phew! You have no idea how happy your comment made me Deb! Tons not being successful at all is soooo frustrating. I’m happy that for most people it IS working. Such a relief. I wonder if the different cooking times are related to the acidity of whatever liquid is being used – like the tomatoes in the chili with kidney beans would definitely make it take longer. I know on the stove, when I put some flavored broth (that was likely both acidic and salty), I could not get my split peas to soften after 4 hours of boiling (which is ridiculous) – but I suspect the IP might have been able to do it – anyway, just a thought as to the difference in times for bean-cookery. Thanks for the post – keep up the awesome posts, and the cheery responses to the frustrated few. I am new to instantpot. Today I cooked kidney beans. The beans are old probably several years or more stored in glass jars in my pantry. I soaked over night 12 hours. Rinsed. Set the pot to 32 minutes. I did natural release for 30 minutes. I thought it was too long but was cautious as I didnt want bean froth all over the kitchen. Of course they were mushy. Any thoughts? Thank you. The cooking time variation might have to do with altitude. I grew up in Utah and we always had to adjust bake times and add extra ingedients for cakes. Altitude definitely plays a role but it’s only few minutes, plus people are complaining that their beans are mush with my timings. I live at sea level so if altitude was the problem they’d have to be living thousands of feet below sea level, which is highly unlikely. I am starting to think that it is a combination of bean age and the individual instant pots but I can’t be sure and that’s what frustrates me the most. I can’t come up with like a formula that will work for everybody everywhere. I have a new Zavor pot so not apples to apples but probably pretty similar. Two things that may be the difference in timing – minerals in the water supply, and the amount of time for the presoak. I also live at sea level. My black beans soaked for nearly 15 hours (I forgot about them) but I was chicken to cook as long as you recommended anyway having past experience with an old fashioned stove-top version where 8 min was about right for medium softness. I cooked under pressure for 9 min and did the NPR of 20 min. They were definitely at the soup softness but not complete mush (which is great for soup anyway). Next batch of beans I make I’ll soak for exactly 8 hours and let you know if there is a significant difference. Oh, and my beans are embarrassingly old so should have taken longer… or not? Maybe your black beans are bigger than mine? I get mine in bulk at Sprouts. Thank you so much for your feedback! This is great information. Can’t wait to read what you write about the 8-hour soak situation. I do wonder if there are different sized black beans. I should probably measure the ones I use for reference. That’s actually a great idea. I followed your timing and my black beans came out ridiculously mushy. I actually felt 25 min was too long. Going down to 8-10 min next time. I’ll have to do my own experimentations over the several months. I’m so sorry the timings didn’t work out for you. I’ve now figured out that the age of beans plays a big role in the timing and unfortunately isn’t something I can take into consideration in my calculations yet because it’s impossible yet to find beans of different ages. Do you know how old your beans were? I’d love to get some more info so I can hopefully draw conclusions from all your comments. My black beans keep taking at the very very east 20 minutes or they are sandy and undercooked. I sauteed onions, celery, garlic, and spices in the instant pot before adding the beans and covering them with cold water. Result: The beans were quite soft, and were floating in lots of water (I probably added too much). I drained them, and will use them in soup; they would be too soft for using in a salad, but might be okay for beans and rice. Cooking beans is not an exact science, especially when you are uncertain of the age of the beans. Your guide is very helpful, as at least people know where to start. Thanks for your hard work! Thank you soooo much for your feedback!! Especially revealing all the timing and amounts and brand of black beans. This is so helpful!! Thank you! This is weird but I mis-read the times for mung beans (hazards of a small phone !) so I cooked 2 cups beans and 2 cups water on high in my Instant Pot for 15 minutes and then let them NPR for another 15…they came out VERY al dente ! Edible but not soft enough for me…I think it’s because I didn’t soak first ? I would have thought they’d be absolute mush after pressure cooking for 15 X longer than the recipe called for. (I’ re-cooking for another 5 minutes as I type this !) Still LOVE this ez guide for cooking beans !! Thank you for your kind words Ronda. Soaking is absolutely essential to experiment with my timings. From what I learned over time now though is that the age of beans plays a big role, too. I’m currently trying to reach out to a couple brands to find out if they always package same age beans of different age beans. Digestive problems with beans are caused by some complex sugars. Bring the beans to a boil to break the capsule so the sugars will dissolve, then add a half teaspoon of baking soda to the beans while they soak will make the water more alkaline, and a rinse in the morning will finish the job. Well I’ve used cooked rice or shaved carrots for the farting problem always works when I’ve used it. No one I’ve served had that problem and was very glad cause this is because I be wanting my beans like right now hee no time for soaking beans but I agree with the soaking ok!!! These times leave me with mush. I am using an 8-qt IP-DUO. Black beans soaked for 8 hrs. BBs at HP with NPR take 6 mins. Rancho Gordo brand puts a Use By date on it. It’s pretty reliable. Thank you so much for ALL of the time and work you have put into the information provided!! I am going to do a mixture of pinto and great northern. Ive never cooked northern so I have two questions; can these be soaked together and is the cooking time the same for both? Hi Janet, I’m sorry but I’ve never even heard about Northern beans. So, unfortunately, I have no clue how long they take to cook. Does the packaging say anything about timing? Could you figure it out depending on what it says on the Pinto Bean packaging and the Northern Bean packaging and calculate how much less time it takes to cook the Pintos in the IP and deduct the same percentage of time from the Northern Beans? Northern beans are basically the same as navy beans.. I cooked 1 lb. northern small white beans just two days ago. I soaked them for 12 hours. Then put in white onion and garlic and 1 cup of ham pcs from a ham I baked a while ago (defrosted). I added 4 cups of water & 2 cups chicken broth to the pot and I cooked them for 35 minutes, letting the steam fully release. I used the saute setting to boil out a little of the extra water. They came out great. Thank you for the feedback Tamara! Super valuable! Hi! I’m not sure if your question was answered or not, but the age of the bean does affect cook time. Fresh, dried beans (less than a year from harvest) will cook in less time than an older dried bean. I’m not an expert, but I do grow beans and that has been my experience. I just got an instapot for Christmas so I have been playing with the cook times. Thank you for taking the time to put all this information together! It has been helpful. Yes, I’ve learned that now from several comments. Once I have extensive info on how age affects cook time I will update the post that’s for sure. I have to first figure out how “old” beans are for the most part when sold in regular grocery stores for that I have to contact a couple brands. It’s on my to-do-list. Thank you for your feedback. Thank you very much for this post. I have a question, as I just received an instant pot and I’m also an inexperienced cook. My mom has a recipe for beans, but I was wondering how I might convert that to the instant pot structure. I have the canned red goya beans, and I don’t mean to soak them. According to your guide, I would put them in the pressure cooker for 20 minutes, along with all the other ingredients? + 2 inches more of water than the bean height. I have no idea if that’s correct? I would have the beans with small pieces of beef and some cut up red onion. Would this work? This recipe is for dried beans, so you don’t have to buy canned beans which are much more expensive. The canned beans are ready to use in your recipe. #1. 30 min in IP for presoaked kidney beans is way too long. I’ve been cooking using IP over 2 years, 10 minutes is enough. For chickpeas – 4-5 minutes. #2. Here’s the article which answers to all who believes that soaking helps to avoid digestion issues. Long story short – it does not, since it’s all on your individual ability to process fiber. Yes, the fiber is the culprit and soaking does not do anything with it. Thanks for your reply, Lorena. So sorry that your spam filter does not allow links, so I have to quote. I hope PubMed is scientific enough. Enzymatic degradation of oligosaccharides in pinto bean flour. J Agric Food Chem. 2006 Feb 22;54(4):1296-301. The loss of raffinose oligosaccharides after soaking pinto beans for 16 h at the room temperature was 10%. No link, you can google it. I doubt that 10% loss can make us feel better. Question: does soaking have any scientific proof to be efficient in reducing the consequences? If I don’t soak, I suffer. I have to pressure cook soaked chickpeas for at least 40 minutes, pinto beans 25 and small red beans 42. That’s very very interesting, do you have any idea how old your chickpeas could be? I usually cook for 22 minutes high pressure + natural pressure release and they are perfect. I have no clue how old my chickpeas are though. They just must be always about the same age, that’s for sure. They always cook in the same time. Also, do you do natural pressure release? Sorry if my question is a bit stupid but it’s my first timing using Instant Pot. should I turn the steam release handle on sealed or venting position while cooking the beans? generally, I don’t know when to vent or release? also what do you mean by natural or quick releasing? thanks! When you’re pressure cooking, the steam release valve should definitely be sealed so that the steam cannot escape and the pressure builds up. If it’s opened (venting), you’ll never get the pressure. If you quick release, you turn the valve to “venting” and the steam will shoot out, releasing the built-up pressure in your pot. Natural release just lets the instant pot cool off and the pressure go down on its own (takes a while). I just got an Instant pot for Christmas. I specifically asked for it so that I could have a “quick” to cook many hundreds of pounds of black and pinto and navy beans but I just inherited from my dad’s food storage. So I believe I am going to be able to help you well, once and for all, determine if it is the age of the beans that increases or decreases the cooking time. Because these dried beans I inherited are over 10 years old! ( don’t worry they were properly sealed for long-term food storage.) I’m also located at around 4500 feet above sea level, so I will definitely be having to play with the cooking time and I will keep notes and share them with you from one batch to the next. By the way I am giving you a 5-star post rating in advance for two reasons, one because you were so meticulous about your methods for testing times which gives all of us a wonderful point of reference, two to help offset the undeserved 1-star ratings that some people gave you just because they’re beans ended up mushy when any number of things (elevation, age of beans, could instapot size maybe be a factor?) could have been different to cause it. OMG, Stephanie, thank you so so so much!!! I can’t wait to hear about your results!!! Please e-mail me so we can discuss. This sounds simply amazing. I don’t think instant pot size really matters. I do believe though that some instant pots heat more than others based on experience with people getting the burn warning with certain recipes that require little water. I also believe NPR times play a big role. I have to change that in the description to put a maximum time. I’ve had people report their NPR took over an hour and I believe their safety pin must have simply been stuck. A tiny little shake of the lid after 25-30 minutes should show if it’s stuck or if there is actually still some pressure in their (which I doubt). Do you can? I add a clove of garlic to each quart. Really yummy and a quick meal. I do not see where stipulate what pressure to use? High, medium or low? Hi, I’m sorry this isn’t too clear. HP means High Pressure. All timings are for high pressure. I will add that to the recipe card so it’s clearer. Thanks for the feedback. Has anyone tried the 15 bean soup dried beans? If so, how long did you cook them? I made 15 bean and ham soup recipe for instant pot (which turned out amazing). It called for 40 min at HP with 20 min NR. But this contained ham, veggies, etc., as well. It’s New Years Eve, what about black eyed peas? I plan on soaking but how long should I cook them ? Sorry Catherine, no clue. I will have to test and add little by little to this post. When I ran all the tests I tested with all the beans my bulk store had in stock. Sorry for the late response Catherine. But I just wanted to share my most recent experience with cooking black eyed peas. I pre-soaked 1 cup and pressure cooked it for about 8 minutes. It turned out perfectly cooked and held its structure well. I used it for a curry. Black eyed peas are one of the quickest beans to cook so it doesn’t take that much time in the Instant Pot. Hope this helps for future recipes! Also just wanted to add that I cooked my black eyed peas in an Instant Pot Steamer Insert Pan. It was not cooked in the inner cooking pot which the Instant Pot comes with. I meant it was cooked in the Instant Pot Steamer Insert Pan and then placed inside the inner cooking pot. But I didn’t cook the black eyed peas directly and only in the inner cooking pot. Sorry for any confusion! Awesome!!! Thanks for the feedback Sheila!!! Others will benefit from this info!! Perfect timing on the black beans! Added my own twist with jalapeños, carrots, onion & cumin. thank you so much for coming back and letting me know!!! There must definitely be something going on with the age of the beans if some have perfect beans with my beans and others total mush. Ok, Lorena, I’m going to give this a try. I’ve got a leftover Christmas hambone and I want to cook it with navy beans in the instant pot. My pot is 6qts. I plan to soak two cups of beans over night and cook them 30 minutes tomorrow with onion. I generally do this on the stove for a few hours and they come out delicious. so I have high expectations for the instant pot. Do you have any suggestions as to how the broth can be rich? That sounds amazing!!! What do you mean by rich? In flavor? You could sautée some bacon before adding anything to the pot, then add a diced onion to the bacon and bacon fat and once translucent add garlic, and then the hambone, beans and chicken broth. That sounds pretty amazing to me. Add a quarter cup of barley. It will give it some body and a silky broth. Oh, nice idea!! I will give that a try next time. I will be trying this with VERY old beans that I grew 3 years ago. Soaking my aged small lima beans right now. Going for 25 minutes tomorrow because they are so old. I appreciate the depth and complexity of your post. Outstanding job! Thank you so much Brooke!! Please come back and let me know how they turned out. I’m really interested in finding out more about cooking times for beans of different ages. Navy beans, soaked 11 hours. I wanted them for a salad. Feeling your times were long I went with 20 mins, NPR. Complete mush :(. Would work great for blending into a dip. I’m so sorry they didn’t turn out for you Anna. I’m still so sad some people don’t have success with my times. It seems the freshness of the beans play a big role and I don’t know how to test this because I don’t know how old or young the beans I buy at my stores are. Hi Michelle, thank you for your feedback. I just went in and added a note to the recipe. I’ve only tested cooking after 8-12 hours of soaking and I’m starting to believe that soaking longer changes the high-pressure cooking time required. I’ve had several comments about beans being mushy after 24-hours soaking. I want to believe it could have been that. I also changed the “full NPR” to 20 minutes NPR just in case so people who have their safety pin stay stuck don’t wait forever and risk mushy beans. I hope people will have better results like this as this is basically how I cook my beans. My safety pin always drops around the 20-minute mark. FYI. I just tried 12 hr soaked brand new navy beans for 25 minutes + MPR (because I was going to cook them longer later to make baked beans anyway) and they’re also complete mush. Not a big problem because I will turn them into a soup later in the week, but just wanted to add to the conversation! Will try again tomorrow! THANK YOU!!! Brand new as in just harvested and dried? That would explain a lot. Why the snark? Not everyone has trouble digesting cooked-from-dry beans. But if someone doesn’t do it your way they *like* having gas? Just state your preference and leave it at that. No need to mock others because you have an inferior alimentary canal. It was intended to be funny but of course, you can understand it the way you like. I never in a million years imagined someone could misunderstand this and be offended. I’m happy that you to have a *superior* alimentary canal, I guess. Oh my God, seriously Joan. Get over yourself. Obviously you have some deep seated issues that you need to take your anger out on a kind woman trying to teach people the best way to cook beans. Pathetic. Thank you so much for all the detailed info, super helpful. curious what you’d recommend for using these? My husband bought them and I’d like to use them in my new Instant Pot 8qt? Any tips appreciated. Hi Christine, so the amazon page doesn’t show exactly which beans are in there but I assume this blend would be great to make my Instant Pot Lentil Soup. Make sure to soak overnight, then drain and rinse and then proceed with the recipe. White kidney beans were mush at 30 minutes and NR. I am very sad to receive a 1-star review when I don’t have any information on white kidney beans in this post. White Kidney Beans (also called Cannellini Beans) cook very fast so yes, 30 minutes is way too much for them unless you want to make them into soup. I would really appreciate it if you changed the star-rating once you tried any of the cooking methods mentioned in the post. I am about to attempt my first dish in my IP Duo, but I’m slightly confused about your prep and total cook times. It’s say 1min? Tracie, there is different cook times for different kinds of beans. Please refer to those times. It’s impossible to put a “total cook time” when the guide is for several different beans and times. I just had to fill that out with a number. I just tried my first batch of soaked black beans in my 3 qt IP, set for 25 min on high. After reading the comments about mush and also the IP manual, I decided to quick release. Very messy, it spit all over so I turned the vent down and gradually let it vent. It only took a couple of minutes. The beans were still boiling and I can easily see how leaving then in for another 15 min would cause mush. They’re about perfect, some are broken, but I’m not picky. My IP manual says the same thing that somebody else mentioned – cook soaked black beans for 4-6 min but they also say this is the minimum time. Another concern, which nobody has mentioned, is the toxicity of undercooked beans. They can make you VERY sick, so be careful. Thank you for your insight Margie. Yes undercooked beans are not good to eat. The good thing is, you can always get your pot back to pressure and cooke a couple extra minutes. No problem at all. I’m still very confused with these timings. At 4-6 minutes my beans are not only undercooked they are practically raw. Super sandy and yucky. It’s soooo weird. Have you considered altitude & pot size in your calculations? I live at about 2200ft & have an 8qt pot. Nothing I cook uses the same times as I find online. For example, I made baked beans, using Navy beans, a few days ago. I did them for 40 minutes on high pressure, with 10 minute NPR. They were just barely starting to soften. Cooked them another 20 minutes with 10 NPR & they were fine. Stumbled on your site trying to find out how long to cook kidney beans to add to chili. At least I have a starting point. Hi Lisa, from what I’ve read you have to add 5% cooking time per every 1,000 feet of altitude. I will never be able to confirm exact cooking times for anything but sea level because that’s where I do all experiments and cooking. From what I’ve learned now through comments of other people the age of the beans plays a MUUUUCH bigger part in timing than the altitude actually. Some people have great success with my timing and others say their beans are total mush when they can’t be any lower than I am, right? Just Amsterdam and Venice are lower. Unfortunately, it’s close to impossible to determine bean age so I’m super confused how I should address this in the post so everybody is successful with my timings. I don’t even know how old the beans are that I usually buy but they seem to be the same age always because they always take the same time to cook. I would appreciate info from people cooking at 6000 ft altitude as far as time and amount of water. Thank you for trying to figure all this out. Hi Judy, water to rice ratio stays the same, NPR stays the same you just have to add 5% cooking time per every 1,000 feet of altitude. I’ve found in my personal experience that the older the bean, the longer it takes to get tender. That is really interesting to read. I will definitely have to dig deeper into this to make this guide more comprehensive. I just did a pound of overnight soaked kidney beans for 20 minutes of pressure and after 15 min of natural release I did quick release. They were plenty soft (fine for my chili) but I will probably decrease time to 15 min next time and check on them after 10 min. Judith, I’m glad you’re finding the right timing for your beans. I’m still super confused about some people getting good results with my timings and others all the way to total mush. I just can’t understand that and it’s so frustrating. Exactly, the “use by” date on beans and grains is really misleading I find because they don’t rot. Some become kind of yucky but that’s usually decades later. I have the instant pot that just has a “beans” button that a choice of low med or high (lightly to more cooked) I chose medium and got very mushy beans, but my pot didn’t naturally vent and I’m sure that’s why they kept cooking. I don’t know why the pin didn’t pop and let it vent, I can only think that the bit of foam from the cooking beans made it just sticky enough to not vent on its own, not the timing of the beans. Jennifer, with both Natural Pressure Release and Manual Pressure Release the pin doesn’t drop UNTIL ALL PRESSURE is out. The pin is a safety mechanism so you can’t open the pot while there is still pressure inside resulting in an explosion and serious injury. The reason Instant Pots are so safe to use are because of the safety pin. Natural Pressure release takes anywhere from 10-30 minutes depending on the volume inside. If after 30 minutes the pin didn’t drop on its own you can turn the valve to venting and manually release the remaining pressure. If no air is coming out it simply means the safety pin is stuck and you have to shake the lid a tiny little bit (only when the nob is on venting and ALL air out) and the pin will drop. Is it possible elevation plays a role in the discrepancies? Elevation does play a role but not that big of a role and only in extreme elevation. “Cooking time under pressure should be increased by 5 percent for every 1,000 feet after 2,000 feet above sea level” – Anderson, B. M. (1980). So that’s definitely not the problem here with such large discrepancies. Also, I myself am at sea level so my cooking time should be the shortest of all. I wonder if it’s just personal preference and bean age? Times were way too long – my beans were mush. Even tried a second time. Soaked kidney beans overnight, and finally found that cooking for 18 minutes is right. I tried 25 and 30 minutes, and they were MUSH both times. Is the timing from when you close the lid and set it on pressure cook? Or is it after it has come to pressure? That would make a big difference. AJ, when you close the lid you set it to the minutes and the cooker then first gets to pressure and once the pin jumps up the timer starts counting down the minutes. It’s all automatic. If you are using a stove top pressure cooker, you start your timer once the cooker came to pressure, not when you put on the lid. Do you know anything about putting your soaked beans through the yogurt process of the IP so that they sprout a little before cooking? Thanks! Ohhh, no, never thought of that Rebecca. I only sprout lentils and that just at room temperature. I soak them 12 hours, then drain and rinse and leave in a colander sitting on a bowl from then on on the kitchen counter and rinse every 6 hours. It takes about 2-3 days until they start sprouting. Hi Lorena, I was very impressed with your rice cooking guide and I use it all the time and it is trulu foolproof. I was sohappy to find your guide how to cook bean in IP as I always struggle with timing of those. I cooked black beans (soaked overnight for 12 hours) for 25 min and they turned to mush, barely suitable for soup. What went wrong? everywhere I read it says a few minutes for soaked beans…. My experience over years is that yes, older beans take longer to cook. Perhaps you buy them at a market that doesn’t sell a lot of them in a timely manner, so they dry even more. That’s is definitely very interesting and something I want to find out more about. I buy most my beans at a health food store that sells them in bulk. I have no idea how fast or slow they sell them, that’s for sure. of us at home but will likely batch cook. Hey Kim, I have the 6qt and think it’s perfect for everybody from singles do big families of 6. In my instant pot I can cook a single cup of rice without a problem and I can also cook 3 so that’s super convenient. Thanks for providing all this info. I have had a hard time getting beans cooked properly (i.e., not overdone) in my IP. Following your directions, I soaked dark red kidney beans for 11 hrs in plain water at room temperature, drained and rinsed well, and then cooked in the IP with fresh plain water for 25 min, hoping for firm beans suitable for salad. Following cooking I allowed 10 mins of natural pressure release and then manually released the rest of the pressure. I found that about half the beans were “broken” in some way, split in half widthwise or missing their skins — as if they had been massively overcooked. I note that this website (http://instantpoteats.com/instant-pot-101-how-to-cook-legumes/) recommends 8-10 minutes for soaked kidney beans. Where does the discrepancy come from? Sorry, should have said 20 mins of natural pressure release before finishing the rest off manually. The beans that result are fine for chili and stews, but too broken up for use in salads. Hm. Joe I’m really intrigued. If I cook my beans for 8-10 minutes they are mostly raw still inside. I’m also confused why it says 8-10 minutes in that blog post. Also, check out this post where I cook Instant Pot Chili. It has a video at the end where you can see the consistency of how the red kidney beans once cooked on high for 25 minutes + complete natural pressure release: https://greenhealthycooking.com/instant-pot-vegan-chili/ They are all still whole. I wonder if it depends on the origin of the beans? Or maybe there are different types I don’t know about? I don’t even know where mine come from. I buy them at the bulk store. Ugh. I will test again with 10 minutes soon. Maybe my Instant Pots were already overworked when I came to testing with kidney beans. I did all the tests in 2 days with 2 instant pots. They were hard at work those day and I don’t remember if I cooked the kidney beans last in a day. I will test again and come back with my findings. Have always cooked soaked red kidney beans for a minimum of 25 minutes though and always and up with whole beans. Thanks for your comment. I do agree that the age of the beans may have something to do with it. Mine are from a supermarket package and are still a year from their best-before date. Another factor might be water hardness. Ohhh, yes, water hardness could play a role, too. I didn’t even consider that. I will definitely have to do some more research. I’m travelling to Mexico City in December actually and considering taking my Instant Pot with me to do some tests there at 2,000m altitude. Kenji Lopez-Alt recommends soaking beans in salted water to soften the skins and reduce blow-outs. He also points out that soaking doesn’t reduce flatulence. They turned out perfect! Used navy beans for baked beans. Thanks! I’m questioning the timing based on my recent experience. I ended up using the instant pot guide that comes with the pot and used soaked bean cooking times which suggests 4-6 minutes for black beans and 3-4 minutes on high pressure for navy beans and they both came out perfect if not slightly over done at the higher times suggested. I soaked for 5-6 hours. Just not sure what the difference is. Hi Sylvia, I can’t tell you Sylvia. If I cook black beans for less than 20 minutes they are raw. Also, what Instant Pot guide did you use? The one that comes in the box with the pot? I just double checked mine (because I thought 3-4 minutes sound’s really weird) and it says under black beans 20-25 minutes. You DID use dried beans, right? Not canned. If you’re using canned, there is no need to soak them, they are already cooked. In this case the 3 minutes would basically be to warm up only, not to cook. Does altitude affect pressure cooking times? From what I’ve read you have to add 5% cooking time per every 1,000 feet of altitude. I will never be able to confirm exact cooking times for anything but sea level though unfortunately because that’s where I do all experiments and cooking. I live at 6,000′ and all four of the bean varieties I have tried with these times have turned out beautifully. I have been doing beans from dry for about 8 years and had experimented (a Lot) since getting the Instant Pot last year – I’m confident in settling on these instructions. Thanks, Lorena! Thank you so so so much for coming back and rating my post and leaving such a wonderful review. I really appreciate it! Not sure this whole instant pot thing is for me. Followed your directions but wanted beans that were slightly firmer than “salad” beans. So I clicked the pressure setting and selected 10 minutes. Had to run out of the house for a bit. When I came back the pin still hadn’t dropped (1 1/2 hours later). I hit cancel and waited and waited and waited. Finally did a quick pressure release and open up to a pot of mush, swimming in water. Ugh. No idea what I’m going to do (that much soup would take months for me to eat, and I don’t have freezer space). Oh gosh Sam. When you turned the valve to venting was there still any air coming out? I highly doubt it after 1.5 hours. The 1.5 hours in the pot after pressure cooking are what made your beans total mush. Natural pressure release RARELY takes longer than 20 minutes. What does happen sometimes is that the safety pin stays stuck a little. After 20 minutes you can always turn the valve to venting and once the rest of the air escapes (if any is still in at all) shake the lid a little to “unstuck the safety pin” (it’s safe to do that once there is no pressurized air inside anymore, but only then). I’m so sorry you weren’t successful the first time. Please don’t give up. Try again without leaving the house. You have to remove the beans from the pot after max 20 minutes natural pressure release to stop from overcooking. Oh that is really really weird. There certainly shouldn’t have been any pressure in anymore. You have to press “manual” or the newer models don’t have that button, there it’s called “pressure cook” and then you have to make sure the little light is on “high pressure” not on “low”. It has to be “high“. Then, adjust time and make sure again that the valve is turned to sealing. The cooker should take anywhere from 5-10 minutes to get to pressure, and the safety pin jumps up. Once the pin jumps up, the timer starts counting backwards. Once it’s at 0 it beeps. From beep to natural pressure release (pin dropping) there shouldn’t pass more than 20-ish minutes really. Your advice to Sam is so helpful! I just bought an Instant Pot today and I’m soaking beans right now for tomorrow. I’m going to try a 15 bean soup and I’m a bit nervous because there are a lot of different textures and beans in there. Based on your bean times I’m going to try 20 mins and full pressure release and hope for the best. Thank you for the advice! After the cooking time elapses, for NPR, do you hit “cancel” and wait for the NPR to conclude? Hey Susan, I don’t hit cancel. I just leave the pot alone until the safety pin drops. Then you can hit cancel. Thanks for the informative post! I’m planning to cook navy beans. I’m not sure I understand the cooking time correctly – your post says Navy Beans: 25/30/35 + full NPR. Hi Marissa, depending on what your want your beans for (a salad, a side, or a soup) I listed cooking times for different consistencies. In my opinion 12-hour pre-soaked navy beans need at the very least 25 minutes of high pressure cooking + natural pressure release. I’ve tested all kinds of times and maybe my Instant Pots were overheating after the 10th batch and not working properly but I doubt they can be properly cooked in 7-8 minutes. Wow great write up! I’ve noticed all these discrepancies between different websites too and have thought “my how incomplete these questions and answers are!” One thing I didn’t see you talk about though was at what altitude these cook times are for? I’ve recently lived in CO and had to adjust all my IP times. I assume these are sea level times but you never know….! The mung bean times are a tad confusing. When you say 0 + 10 minutes NPR for salad, do you mean allow the pressure to build and then just hit cancel and allow it to drop for 10 minutes? Or allow pressure to build to full, cook at it for 1 minute and then a full pressure drop for soup? Scrolled down and found your responses to others who have asked this. No worries! I m new to instapot —my question. I have large Lima beans. I will soak them -but then do I follow Manuel time for navy or white beans? Hey Teri, ugh, sorry I haven’t tried cooking those myself yet but I would try the navy beans times. I’m a volunteer for @culturesgroup. I’m also a retired food microbiologist. We cook a lot of beans on a daily basis. Sometimes the best way to do so is using an Instant Pot (pots, actually), especially if we’re making a large batch of bean based koji to make something like soy sauce or miso or a sweetener using only the sugars available in grains or legumes or potatoes . I was so pleased to see that you stressed soaking the beans for at least 12 hours. 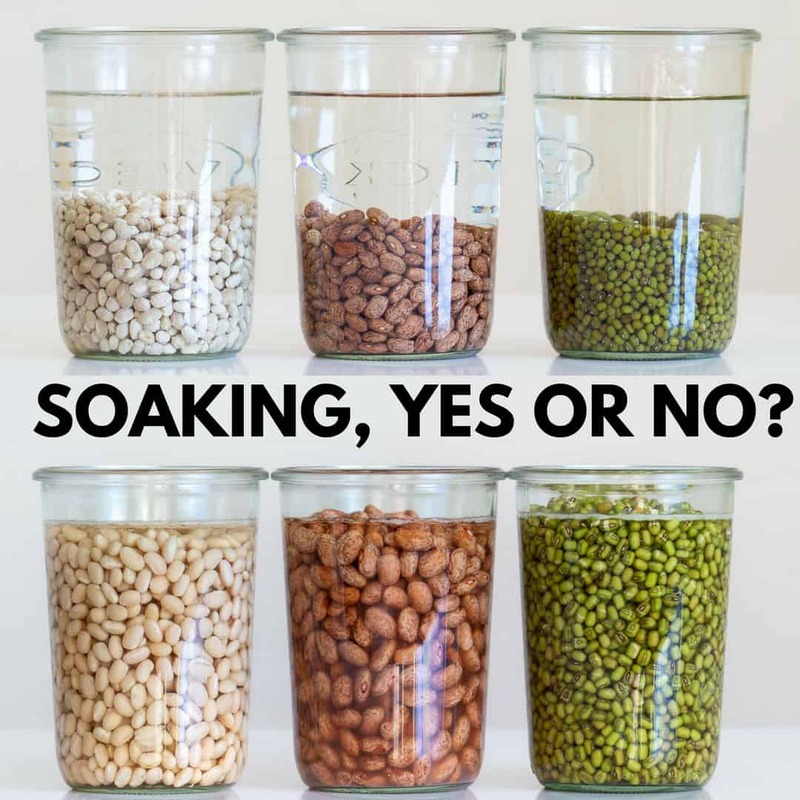 If you don’t pre-soak (we use tepid water and change water several times during soaking to remove potential toxins – especially with soybeans, but not exclusively – and start the process of removing those things in the beans you really should remove! I love you stressed that you took the advice of people that had most likely doing this for decades and decades. For centuries, without microscopes or even knowledge of the yeasts, fungus and bacteria that all healthy foods are composed of, they knew they had to somehow do something to prevent illness while enhancing taste and digestibility. The ability of humans to metabolize or digest legumes (beans), and also at the same time extract nutrients is also dramatically decreased if you don not pre-soak the beans! The nutritional value is greatly diminished. As you mentioned, the things that typically cause gas and digestive difficulties cannot be pressure cooked away. Although another volunteer had forgotten to soak azuki beans for a preparation we are making, after searching around for some justification to do so – I knew there wasn’t but the sirens of convenience! – I soaked the beans after reading your approach. The smell of the soaking water alone reminded me I had done the right thing. Not pretty! Rice soaked beans very well, indeed! I then pressured cooked the azuki beans for 5 minutes and let them naturally depressurize, then added some them in Instant Pots and collected the aquafaba (leftover bean cooking water) for the many things we use that for. So I’m really glad I came upon your site. Oh, and it’s sofrito or soffritto but never ending in an A. Sorry, it’s data accuracy thing. I’m going to check out your rice thing now! Ann, thank you so much for your wonderfully thoughtful and educational comment!! I love it! Great guide and so needed! Thanks! This is an incredibly helpful IP bean cooking guide!! Where would beans for hummus fit in this guide? Are they closest to “salad beans” or “beans and rice”? I’m so happy it’s useful to you Tonya :) Chickpeas I usually cook 20 minutes on high pressure and complete natural pressure release. I want to do another post about chickpeas and lentils and maybe dried peas. I’ll see if I can get the testing done this fall. Yes! Please chickpeas and lentils! Yes I’d love to see this testing results too! And if you ever get around to it: grains and pseudo grains (like buckwheat and quinoa) would be nice too. Hey Dan, I’ll work on it :) I already have a post about how to cook Quinoa in the Instant Pot. Just use the search bar of my blog and enter “Instant Pot Quinoa”. Do you presoak the chickpeas also? Hi Nancy, I soak ALL my legumes (beans, chickpeas, lentils) for 12+ hours. I can’t digest them properly if they haven’t been soaked. Thank you so much Lorena for “doing ALL the work” on getting beans right. Appreciate your blog & sharing on your trials & suggesses so we can just soak, cook, & enjoy. You are very welcome Donna :) Thank you for appreciating my work. 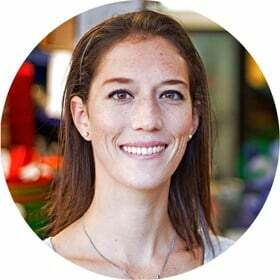 Great article, looking forward to utilizing your research. Question .. have you researched ways to CAN beans so they are like what we buy at the store? First, and only, attempt at canning beans completely annihilated them! More importantly, I have to learn how to can Cream of Mushroom & Cream of Chicken soups (was diagnosed celiac, no wheat, etc). Have you been successful in this? There are polar opposite opinions on canning with or without the cream. Would love to hear if you have a success story on this as I really need to accomplish this. Hi Linda, I don’t have experience with canning or preserving in general. Beans I freeze and that works well. I freeze them in 1.5-2 cup portions in reusable air-tight sealable silicone bags. For canning and preserving in general I HIGHLY recommend the cookbook “Batch” from Dana Harrison and Joel MacCharles. I have it at home and I absolutely love it. ALL the info you will ever need about preserving. So, you use the manual button instead of the Bean/Chili button? Have you ever used the Bean/Chili button and had different results? I only use the manual button because it’s the only one that gives me the option to choose time and pressure. For rice for example the button is completely useless I find. It only serves for white rice, no other rice and it doesn’t cook as nicely as I cook setting everything manually. I usually cook soaked beans in an uncovered pot and it takes 1-2 hours (depending on which type). Never used a pressure cooker for beans but I’m impressed by how much time (and money) it can save. Will sure remember these tips the next time I cook beans. I’m happy your find my guide useful Adrian :) Any soaking is better than no soaking. 8-12 hours is my favorite. Your IP “recipe” for short grain brown rice worked really well. Will soak kidney beans overnight and try your bean recipe in the morning. Thank you! What does the 0+10, 0+15, 1+ mean (mung beans) ? 0 minutes on high pressure + 10 minutes natural pressure release. It’s all explained in the blog post Janice. I reread the blog post 3 times and don’t see the explanation about the mung beans. (0 minutes on high pressure + 10 minutes NPR). Can you please explain here, thank you. Hey Vicky, 0 minutes on high pressure + 10 minutes NPR simply means that you set your Instant Pot to Manual > High Pressure and then set the time to 0 minutes. Which means the pot will get all the way to high pressure and immediately stop heating and turn to keep warm function. You leave it like that for 10 minutes without touching and then you release the remaining pressure until the pin drops, open and enjoy. There is no rhyme or reason to it. No matter what I cook, no matter what amount and no matter if it’s the same amount of the same thing, NPR is ALWAYS different. After 20 minutes it’s defo save to just turn the valve and let the last bit of steam off manually if there is any in there at all. Sometimes the safety pin is just stuck and by turning the valve you notice no pressure in there anymore. It’s save to shake the lid a little so the pin drops and you can open. I’ve done several experiments regarding adding salt vs not adding salt to the bean cooking process and have found the salt myth to be well, a myth. Beans taste better with salt! Soaked and salted is the way for me! Thanks for such a good blog post! I agree. I’ve never had salt prevent my beans from cooking. This is the post I’ve been looking for! Thank you so much! I have a pot of black beans on now (soaked of course! ), and a second pot of white beans waiting. Going to bag and freeze them for quick simple meals!